CCTV can be important safeguard against torture and ill-treatment in places of deprivation of liberty when used appropriately. However, without policies to regulate it use and proper systems for maintenance and storage, it will not only be ineffective at preventing abuse but can also infringe detainees’ right to privacy and confidentiality. suggests what monitoring bodies can do. 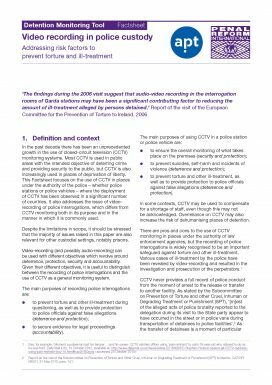 The Factsheet is part of PRI/APT’s Detention Monitoring Tool, which aims to provide analysis and practical guidance to help monitoring bodies, including National Preventive Mechanisms, to fulfil their preventive mandate as effectively as possible when visiting police facilities or prisons. The Tool seeks to support such bodies in addressing systemic risk factors that contribute to an environment where torture or other ill-treatment occurs. Why pre-trial detention can be a high-risk factor for torture and ill-treatment and how monitoring bodies can address it. Part of the PRI/APT Detention Monitoring Tool.